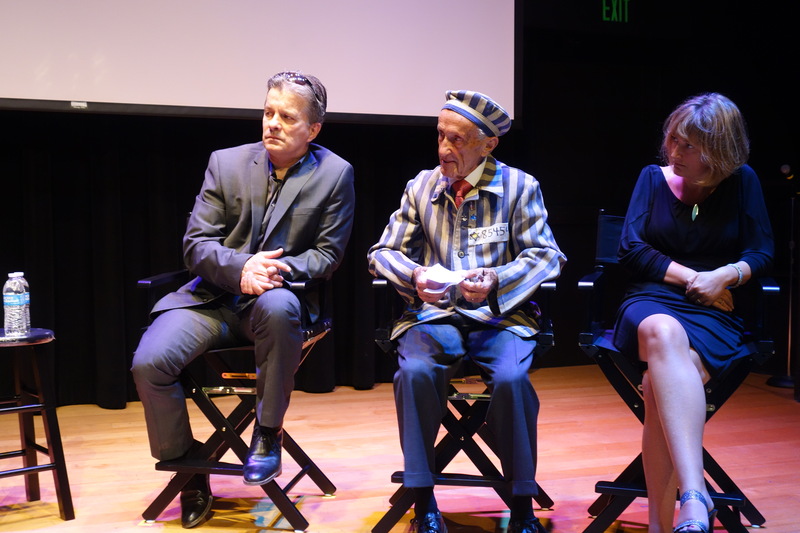 Holocaust survivor Edward Mosberg made his first trip to USC Shoah Foundation last week to learn about the Institute’s work, screen the new documentary in which he is featured, and make a special donation to Institute founder Steven Spielberg. Mosberg was born in Krakow and survived the Krakow ghetto, Plaszow and Mathausen concentration camps, and slave labor at the Hermann-Goering factory. His entire family was murdered in the Holocaust. Today, he is a successful real estate developer and philanthropist in New Jersey, married to a fellow survivor, Cecile, with whom he has three daughters and several grandchildren. Though he has long been a passionate public speaker, sharing his story with students and others around the world, Mosberg is set to reach an even bigger audience through his role in the new documentary film Destination Unknown, directed by Claire Ferguson. Mosberg is one of several survivors interviewed in the film who describe not only what happened to them during the Holocaust but also how they have continued their lives in the decades since. USC Shoah Foundation Executive Director Stephen Smith is an executive producer of the film, and Mosberg recorded his testimony for USC Shoah Foundation in 2016. 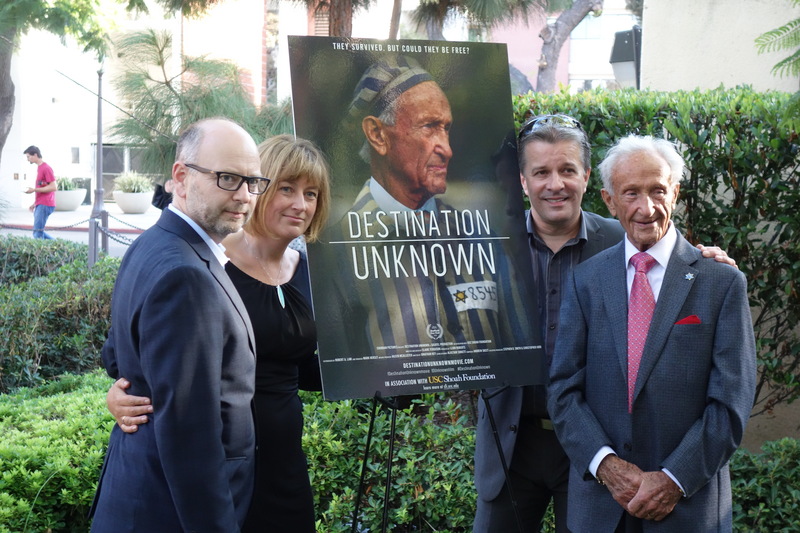 USC Shoah Foundation hosted a private screening of Destination Unknown on the USC campus on September 12. 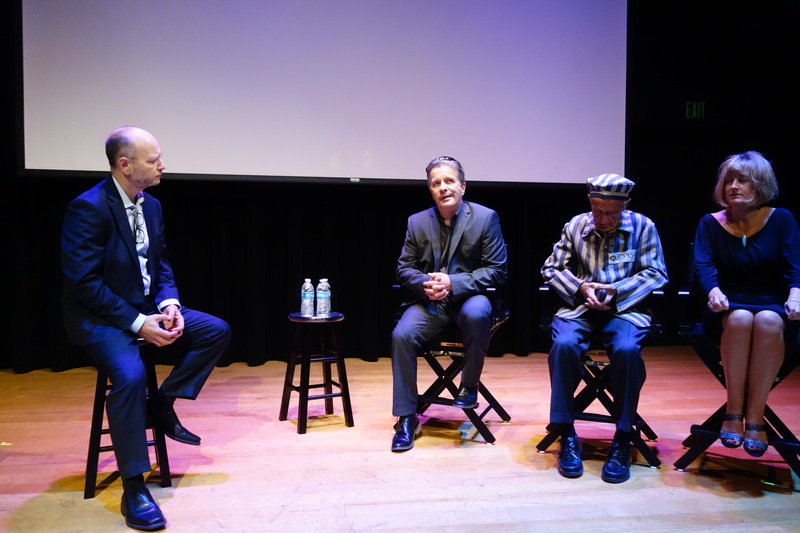 After the screening, Smith led a Q&A with Mosberg, Ferguson and producer Llion Roberts. Mosberg told the crowd that he had actually scheduled his testimony for USC Shoah Foundation three times before it finally happened. First, he was in a serious car accident the day before the planned interview. Then had a stroke the day before the rescheduled interview. After he recovered, his daughter asked if he wanted to try a third time. 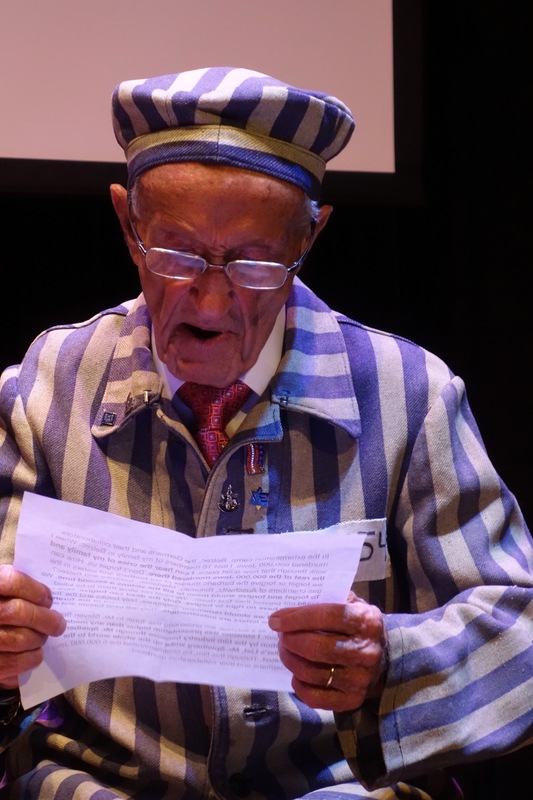 Roberts, a television producer, explained that origins of Destination Unknown go back to 2001, when he visited the Auschwitz-Birkenau State Museum for the first time. In one of the barracks he noticed a photograph on display of a young prisoner who bore a striking resemblance to his own daughter, who was 13 years old at the time. This inspired him to start learning about the Holocaust on his own. Two years later, he was working in New York City and met a man who happened to mention that his father was a Holocaust survivor. Roberts asked if he could interview his father, who obliged – setting Roberts off on a 13 year quest to interview more Holocaust survivors around the world, including Mosberg. In 2014, he connected with Ferguson, who helped edit Roberts’ interviews into the feature-length documentary Destination Unknown. 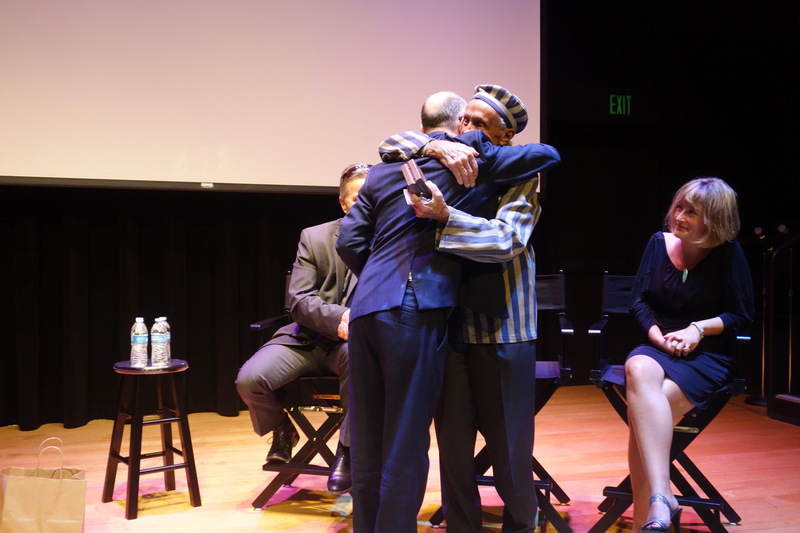 Ferguson pointed out that because the film is composed of one-on-one interviews with the survivors telling their own stories, it has a very intimate feel, allowing the audience to feel as if they’ve really met the survivors in person. For example, she said, a scene at the end of the film with survivor Marsha Kreuzman is particularly poignant. Roberts said education about the Holocaust, through films like Destination Unknown and the educational programs of USC Shoah Foundation, is crucial in raising the next generation of world leaders. The day after the screening, Mosberg, Roberts, Ferguson and several members of Mosberg’s family toured USC Shoah Foundation and learned more about its mission and work. Mosberg also spoke to a history class at USC. 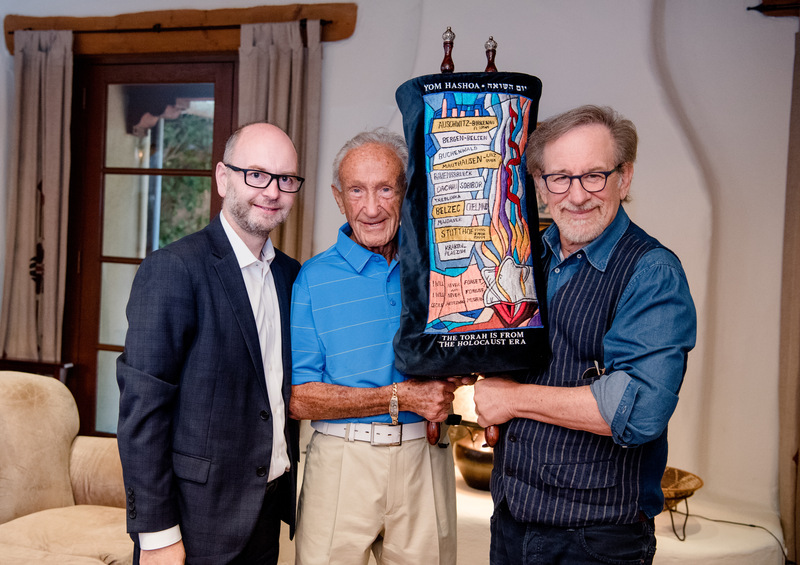 On the final day of the visit, Mosberg stopped by the office of USC Shoah Foundation founder Steven Spielberg to make a remarkable delivery: a 200 year old Torah that was rescued from the Holocaust by righteous gentiles in Poland. Spielberg will donate the Torah to his temple. 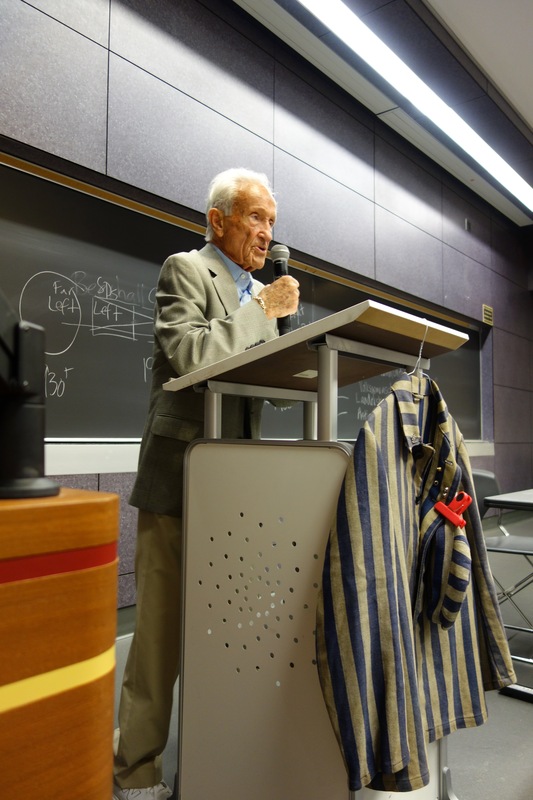 Mosberg credits Schindler’s List with introducing millions of people to the horrors of the Holocaust when it was at risk of being forgotten forever. The work goes on, he said, with Smith and the mission of USC Shoah Foundation.